Popdose Giveaway: "China Beach: The Complete Series"
Popdose is giving away one copy of China Beach: the Complete Series to one lucky reader! China Beach was hailed as groundbreaking television when it debuted on ABC in 1988. At that time, the Vietnam experience was seen primarily through the eyes of men, in films like Platoon and Full Metal Jacket, and on TV on shows like Tour of Duty. Vietnam vet and journalist William Broyles Jr. and John Sacret Young decided to deliver the war from the perspective of the women, military personnel and civilians who were present during the conflict. Set in the Vietnam locale of China Beach, at the “Five and Dime”, also known as the 510th Evacuation Hospital and R&R center, the cast was made up of US Army doctors and nurses, officers, soldiers, Red Cross volunteers and civilian personnel, either on leave or at the end of their tour of duty. Besides a top-notch production team that included future Emmy winner John Wells (ER, The West Wing), China Beach featured an excellent cast, many of whom were in the early stages of their careers, including Dana Delany, Marg Helgenberger, Michael Boatman and Ricki Lake. For years, fans of the series, which ran from 1988 – 1991, have been anxiously waiting its release on home video… in any format. What’s been holding it up? The music. One of the hallmarks of the series was the use of music — iconic, emotional songs from the ‘60s and ‘70s featuring artists ranging from Bob Dylan and Joan Baez, to Aretha Franklin and Stevie Wonder and dozens of others. ally, after years of painstakingly clearing the rights to hundreds of musical copyrights, Time Life, in conjunction with Warner Brothers Home Entertainment Group, will release China Beach on DVD for the very first time. China Beach: The Complete Series will be offered as a 21-disc collector’s set featuring all 62 episodes and over ten hours of exclusive, never-before-seen bonus features including a recent cast reunion, extensive interviews with Dana Delany, Marg Helgenberger, producers John Sacret Young and John Wells, original featurettes, as well as “Tales from the Five & Dime”, a collectible memory book containing casting notes, rare, archival photos, emotional, heartfelt letters from Vietnam veterans and more. Time Life made sure that the DVD collection would be released with nearly all of the original classic rock and soul music songs from the original broadcasts. The 268 cleared songs featured throughout the series include “Ain’t Nothing Like the Real Thing” by Marvin Gaye and Tammi Terrell, “Nowhere to Run” by Martha and the Vandellas, “Baby, I Need Your Loving” by the Four Tops, “My Girl” by the Temptations, “I Got You (I Feel Good)” by James Brown, Manfred Mann’s “Do Wah Diddy Diddy,” “Brown-Eyed Girl” by Van Morrison, “Piece Of My Heart” by Janis Joplin, Sonny & Cher’s “I Got You Babe,” “Respect” by Aretha Franklin and many more. China Beach: The Complete Series will be available exclusively through Time Life at www.timelife.com/chinabeachdvd in mid April for $199.95. You can pre-order it now, with shipment beginning between April 15 and April 19. The box set will come handsomely packaged in a deluxe collector’s box, featuring metallic printing and original artwork and logo treatments from the series. The packaging also includes keepsake China Beach dog tags that can be removed from the set and worn. In addition to the 21 discs in the set, fans will find special liner notes penned by the cast, creators and writers, the collectible 36-page book, and ten hours of specially-created bonus features such as: footage and behind-the-scenes stories from the 2012 Cast Reunion, plus series creators; new interviews with key members of the cast and crew; numerous featurettes such as “Life’s a Beach – A Look at the Real China Beach,” a documentary about the real China Beach/My Khe Evac Hospital, “Hit the Beach – How it All Began” about the origins of the program, audio commentaries on four episodes from Dana Delany, John Sacret Young, director Rob Holcomb, and writers Lydia Woodward and Carol Flint, three roundtable discussions with cast and crew, rare behind-the-scenes footage from the final China Beach episode and more. 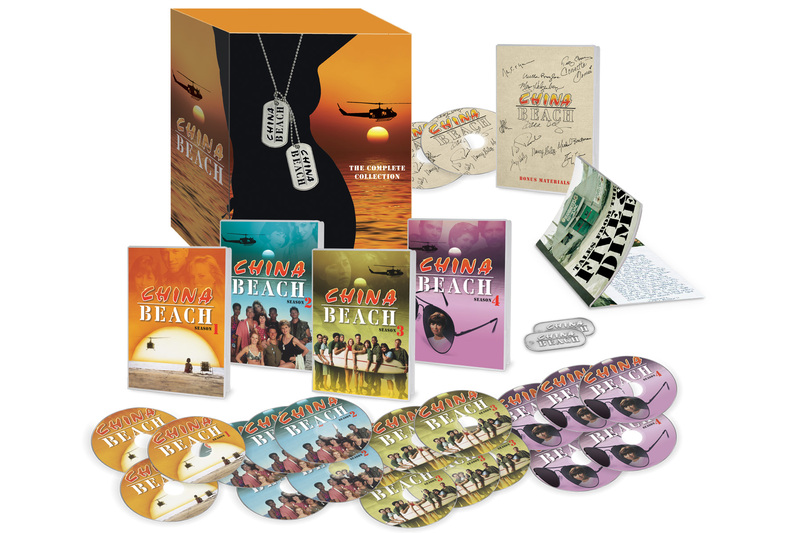 For the many die-hard China Beach aficionados who’ve patiently awaited the release of the series, Time Life has also created CHINA BEACH: THE COMPLETE SERIES – 25TH ANNIVERSARY COLLECTOR’S EDITION. Priced at $274.95, the unique set includes three original, complete scripts, with reproduced covers sporting autographs from the entire cast and key production personnel, along with a numbered Certificate of Authenticity. Also included will be four 8” x 10” color photographs of the original China Beach cast and the recent reunion, suitable for framing. This collection is a dream come true for longtime fans of China Beach. And Popdose would like to help make one of your dreams come true! 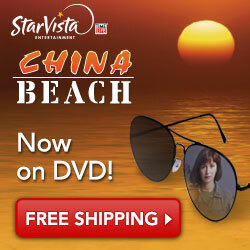 We have one copy of China Beach: the Complete Series to give away to one lucky reader! 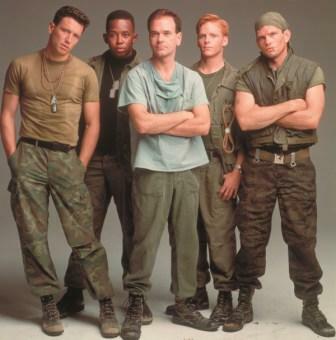 Name the song and the group that plays over the title sequence for China Beach. Send you response to Mr. Malchus@popdose.com with “China Beach” in the subject line. Deadline is April 16th. 17:00 PM PT. A winner will be chose at random and notified by email.